PALATKA, Fla. — Targeting the backwaters of the St. Johns River system, and finding an 8-3 “mule” on the last day led Edwin Evers of Talala, Okla., to the win Sunday in the Power-Pole Citrus Slam with 77 pounds, 1 ounce, shutting out three-day leader Alton Jones and hard-charging Terry Scroggins. Trailing Jones by about 2 1/2 pounds before Sunday’s finale, Evers sealed his sixth Bassmaster win by overtaking Jones and besting him by more than 3 pounds. Jones ended in third place with 73-12, leaving second place to Scroggins, who had 74-3. Evers had one word to describe how he felt about the Bassmaster Elite Series win, worth $100,000, and a 2012 Bassmaster Classic qualification. It was his second Elite title, the first taken on Lake Erie in 2007. Sight-fishing the flats of a St. Johns lake he shared with many other Elite pros the first day, Evers started out in 20th place. He made a crucial decision to leave the community hole and find more private water. He climbed into fourth on the second day, improving once again on the third day when he took the runner-up spot behind Jones. His catches were fairly consistent — 16-8, 22-5 and 19-4 the first three days — but it was his haul of 19 pounds on Sunday that helped him to the win. 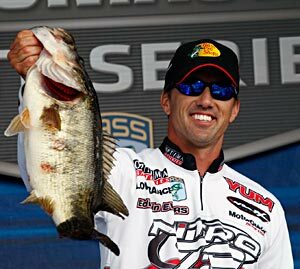 Not to mention an 8-13, his big fish of the day and the fish that helped him climb into the winner’s seat. “It was a fish that I’d found the second day, really shallow,” Evers said. “I went there the third day, and Scroggins was there. I turned around and left. I went there second thing this morning, and the northeast wind held the water up, and I ended up catching the male. It was actually the second time I’d caught him — I lost it and he bit again. She bit five or 10 minutes later. “She was a mule,” he said. Evers said he hit many spots over the four days, including one area where he had to saw off overhanging willow branches to be able to put his lures in front of spawning bass. Sunday afternoon’s 15- to 17-mph winds hurt some of the final 12, but helped Evers. His water was stained, hard to reach and in areas that had not been pounded by the field. He credited a new formula Yum bait, the F2. He used several styles, including Wooly Bug, Money Craw and a Craw Papi. Runner-up Scroggins, who gave Evers a little advice as the tournament began, also got a tip from another Elite pro in the top 12. Knowing he could not win, Casey Ashley stepped back from going to a big bass he’d seen in a canal, and gave the location to Scroggins. But when he got there, the fish was gone; but he found another nearby. It weighed 7-12, and was a key to his finish. “Without that, I wouldn’t even have come close,” Scroggins said. Competing in his hometown, Scroggins said he was happy to do well, even if he ended as No. 2. “I’ll take second place every day,” he said. With his back-to-back Top 12 finishes, Jones took the lead in the Toyota Tundra Bassmaster Angler of the Year points race from last week’s event winner, Shaw Grigsby. Scroggins moved into second, Kevin VanDam is third, and Evers is in fourth place. Berkley Big Bass honors of the tournament went to Jason Williamson of Aiken, S.C., whose 10-3 lunker from the first day withstood all challengers — and several of those were in the high 9’s. Williamson won a $500 bonus. Final standings on the B.A.S.S. forum. This post is supported by boater safety course boating license.